On 14 April 2010 Eyjafjallajökull volcano in Iceland resumed erupting after a brief pause, this time in the centre of the glacier, causing meltwater floods to rush down the nearby rivers in two flows on either side of the volcano, and requiring 800 people to be evacuated, thousands of flights to be canceled, and rumors to spread in the chess world. 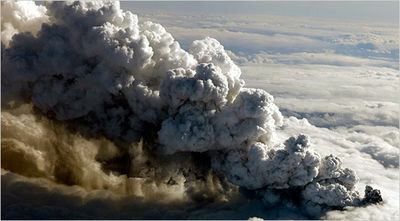 The eruption Eyjafjallajökull produced a large ash cloud which totally blocked airspace. Travel chaos started across the globe as there were significant flight cancellations in Belgium, the Czech Republic, Denmark, Finland, France, Germany, Iceland, Latvia, Netherlands, Norway, Poland, Ireland, Russia, Spain, Sweden and the United Kingdom, with a number of major European airports being closed. That situation leaves half of Europe and most of the major airports blocked. Officials say that chances are the ash cloud will not reach Sofia or hinder the airplanes to the city. However, chess fans and participants in the 2nd quarter Presidential board meeting coming from these regions might be hindered to take off as the air space there is closed. Experts cannot reach an agreement when the ash cloud will clear out. Optimistic prognosis puts deadline of 24 hours, while there are airplane specialists claiming the effects can continue up to 6 months. Flights are being affected all over the world, and even President Obama coming for the funeral of Lech Kaczynski is endangered. The World Chess Championship itself is not endangered, as Anand has already landed in Sofia. The airspace of Bulgaria is not expected to be closed, but the street in from of the playing hall (photo here) will be closed at the time of the opening ceremony, which coincides with a rush hour in Sofia. A vast, high-altitude cloud of volcanic ash continued to spread over northern Europe on Friday as airspace and Europe’s busiest airports remained closed and thousands of flights and millions of passengers around the world — from North America to Asia — were affected. Eurocontrol, the European air navigation agency, said the cloud’s impact “will continue for at least the next 24 hours,” The Associated Press reported. British aviation authorities said there would be no flights over British airspace until early Saturday morning. In the latest restrictions, Germany’s civil aviation authority said Friday that at least 12 of the country’s 16 airports were closed — including Frankfurt, a major hub for Lufthansa; as well as Hamburg, Bremen, Hannover, Dortmund, Cologne, Leipzig, Münster-Osnabrück and Berlin. News reports quoted German air traffic controllers as saying it was difficult to predict when normal flights would resume. The massive plume, caused by the eruption Wednesday of a glacial volcano in Iceland, drifted slowly eastward on Friday over central Europe and western Russia. While satellite photographs from above showed the cloud to be dark and menacing, it remained largely invisible for many people on the ground in Europe. Made up of minute particles of silicate that can disable jet engines, the cloud forced the closure of some of the world’s busiest airports on Thursday and Friday, including Heathrow and Gatwick in Britain, Charles de Gaulle and Orly in Paris, as well as hubs in Ireland, Scotland, Belgium, the Netherlands, Norway, Sweden and Finland. “In general, the situation cannot be said to be improving with any certainty,” the agency said. Britain closed its entire airspace on Thursday, effectively severing links to, from and across some of the world’s busiest aviation routes. The closing represented the country’s most drastic peacetime flight restriction, aviation experts said. About 6,000 scheduled flights use British airspace in an average day, the experts said. It was not immediately clear if the cloud would affect world leaders planning to attend the state funeral on Sunday of President Lech Kaczynski of Poland and his wife, who were killed last week in a plane crash. The White House had said before the volcano erupted that President Obama would depart Washington on Saturday evening to fly to Krakow, Poland, for the funeral. The volcano erupted Wednesday for the second time in a month, forcing evacuations and causing flooding about 75 miles east of Reykjavik, Iceland’s capital. Matthew Watson, a specialist at Bristol University in England in the study of volcanic ash clouds, said the plume was “likely to end up over Belgium, Germany, the Lowlands — a good portion over Europe,” and was unlikely to dissipate for 24 hours or more. Eurocontrol, the agency in Brussels that is responsible for coordinating air traffic management across the region, said Thursday that disruptions to air traffic could last an additional 48 hours, depending on weather conditions, and could extend deeper into continental Europe. The ash from the volcano, Eyjafjallajokull (pronounced EYE-a-fyat-la-jo-kutl), was reported to be drifting at 18,000 to 33,000 feet above the earth. At those altitudes, the cloud is directly in the way of commercial airliners but not an immediate health threat to people on the ground, the International Volcanic Health Hazard Network, based in Britain, said on its Web site. According to the Volcanic Ash Advisory Center in London, as of 1 p.m. Thursday local time, there was still “significant eruption continuing,” with the plume reaching 15,000 feet, but “occasionally” as high as 33,000 feet. On Thursday, 5,000 to 6,000 of the 28,000 daily flights across Europe were canceled as a result of the ash plume, said Lucia Pasquini, a Eurocontrol spokeswoman. The closing of British airspace disrupted the great majority of trans-Atlantic flights, including those on the New York-London route, the second busiest international route in the world after the Hong Kong to Taipei, Taiwan, route, according to the International Air Transport Association. Eurocontrol said roughly half of the 600 daily flights between North America and Europe would probably face cancellations or delays on Friday. Travel chaos extended all the way to the Asia-Pacific, where major carriers like Singapore Airlines, Cathay Pacific, Japan Airlines and Qantas, the Australian airline, were among those that canceled, delayed or diverted flights to and from Europe on Thursday and Friday.